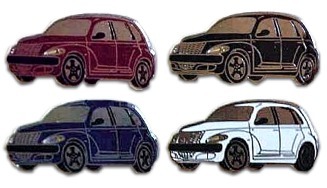 Stylish PT Cruiser lapel pin. An attractive lapel pin with beautiful detail. Choose the color that suits your Cruiser style. Hard enamel and black nickel Clutch back. Your pride in your ride will show with this eye-catching pin.